For all cases disposed of in the current fiscal year (2012) that were credited to Judge Raymond Joseph Dearie in the Eastern District of New York, the median prison sentence was 39.0 months, when looking only at cases referred by the Drug Enforcement Administration falling under the broad category of "Narcotics/Drugs". During the current fiscal year, Judge Raymond Joseph Dearie has sentenced 4 defendants compared with 12 defendants during the twelve months of the previous fiscal year. Over the last five years, the median prison sentence imposed on defendants that were credited to Judge Dearie was 0.0 months. This was 100.0% lower than the 30.0 months typical in New York East and 100.0% lower than the 57.0 months median prison sentence for the nation. Judge Raymond Joseph Dearie sentenced 44 defendants during the past five years. 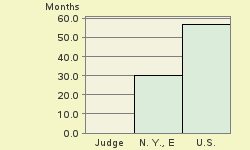 Figure 1 compares Judge Dearie's numbers to those for judges in this district and in the United States as a whole for cases of this type over the last five years. 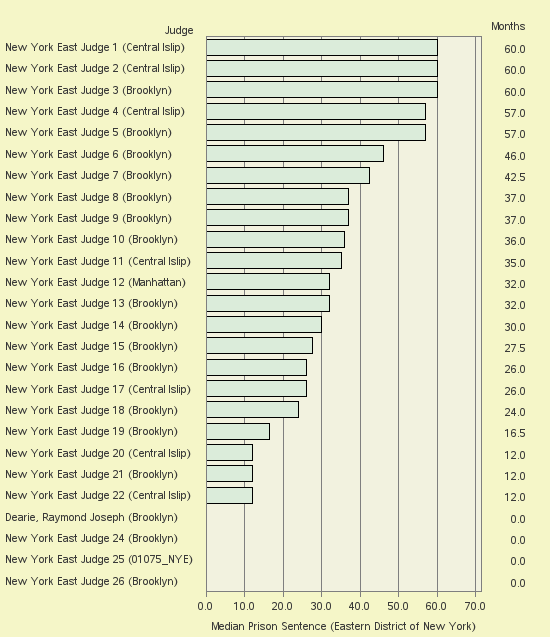 During the last five years there were 25 other judges in the Eastern District of New York with information on convictions during that period. Median prison sentence numbers passed down for those judges ranged from 0.0 months to 60.0 months, putting Judge Dearie's median prison sentence of 0.0 months at the lowest end of the range. The median prison sentence for the whole Eastern District of New York during that time was 30.0 months. Nominated by Ronald Reagan on February 3, 1986, to a new seat authorized by 98 Stat. 333; Confirmed by the Senate on March 14, 1986, and received commission on March 19, 1986. Served as chief judge, 2007-2011. Assumed senior status on April 3, 2011. The lead charge with the most cases disposed of by Judge Raymond Joseph Dearie for the past five years was "21 USC 846 - Attempt and conspiracy". It accounted for 75.0% of all cases. Other lead charges with substantial numbers of cases that were disposed by Judge Raymond Joseph Dearie over the past five years were: "21 USC 841 - Drug Abuse Prevention & Control-Prohibited acts A" (13.6%), "21 USC 952 - Importation of controlled substances" (9.1%).